Global Polymethyl Methacrylate (PMMA) Market size generated over 6.5 billion in 2014, with consumption slated to exceed 3.2 kilo tons at the end of 2022. 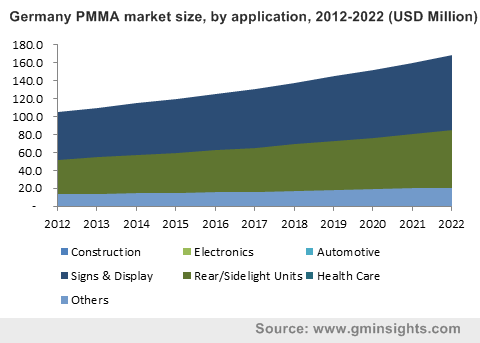 Strong application scope in automotive, electronics, and sign & display industry should drive PMMA market size. Rising spending on advertising campaigns and marketing to create brand equity should drive industry growth. Global advertising expenditure was over USD 510 billion in 2015 and poised to generate over USD 665 billion by 2023, with gains at above 5%. It is a preferable material used for POS applications due to availability in different options which includes transparent, bright hues, translucent, and opaque. Strong application scope in signs & display due to color availability, weather resistance, abrasion resistance, light weight and optical clarity. Global bio PMMA market should witness consumption in excess of 530 kilo tons at the end of 2022. PMMA market price trend will play a critical role in market penetration for bio-based alternatives. Increasing application scope in electronics and automobile industry along with strong R&D spending should drive industry growth over the foreseeable future. Rising awareness for using lightweight materials for vehicle production along with low carbon emission and better fuel efficiency should influence PMMA market size in automobile applications. Regulations in the U.S. may require automobile manufacturers to work on targeting better fuel economy by 2025. In 2014, global automotive sales were slated over 85 million units and may set close to 100 million units by 2018, with gains at over 3.5%. It is mainly used for automobiles applications decorative trims, spoiler, exterior & interior lighting, roof elements, and mirror housings. These components are made from metals and glass, where glass is used for developing window panels. Methanol, acetone, and ammonia are key raw materials used for manufacturing process. These raw materials may poses threat to environment and produce toxic waste by releasing GHG emissions. Strict government guidelines set to reduce GHG emissions and dependency on fossil fuels should fuel biobased PMMA market size. Increasing R&D spending along with technological advancement should create new growth avenues. Companies are focusing to develop biobased products to reduce dependency on depleting fossil fuel reserves. Arkema along with Natureworks, launched product under Plexiglass and Altuglas brand names. This material is developed using Ingeo biopolymers technology which contains 25% PLA. Evonik is working on Avneers technology for integrating bio-based production. Extruded PMMA sheets market size generated over USD 3.3 billion in 2014. Strong application scope in signs and display along with growing LED screens manufacturing for electronics devices should drive extruded sheets demand. PMMA pellets market size may witness significant growth at over 6.5%. These are made in various colors and can be altered into desired shapes and sizes. Strong trend in automobile, healthcare and fashion industry should drive polymethy methacrylate market. PMMA market size from signs and display applications should witness consumption in excess at 1.2 million tons by 2022. Display boards are used in various industries due to its increasing competition among manufacturers to enhance product portfolio. PMMA market size from construction applications is set to witness gains close to 6%. It is used for making doors and windows panels which protects against UV and chemical resistance and other climatic dynamics. Additionally, used for constructing underground aquariums due to properties such as strength, chemical inertness and optical clarity. PMMA demand from healthcare & medical applications may witness significant gains over the foreseeable timeframe. It is used for manufacturing syringes, bone cements, dentures, and cuvettes. China PMMA market size generated over USD 1.2 billion in 2014. Increasing LED panels demand along with manufacturing LED TVs and flat screens should drive industry growth. Inexpensive production cost and cheap labor wages should stimulate regional growth. UK PMMA market may witness gains at over 2.5%. Increasing automobile and construction industry should drive regional growth. U.S. PMMA market size may witness significant gains over the forecast timeframe. Strong regulatory outlook along with increase in construction spending should drive regional industry growth. Global PMMA market share is concentrated with four of the top companies constituting over 60% of the overall demand in 2014. Key manufacturing companies include Arkema, Chi Mei, Mitsubishi Rayon, and Sumitomo Chemicals. Other industrial participants include SABIC, Evonik, LG MMA, Kuraray Group, Dow Chemical, and Makevale Group. Major manufacturing companies are based in China due to relaxed government regulation. Polymethyl methacrylate is a synthetic resin which is produced from methyl methacrylate and polymerization. It is preferred due to its low cost, and easy handling and processing properties. It is a strong, lightweight and clear plastic used as a substitute for glass on account of its weather resistance and energy efficiency. Strong application scope in sign & displays, glass lens, and appliances due to its durability and transparency properties. It is used in lenses of exterior lights for vehicles.